The Newburgh Free Academy Goldbacks defeated the Middletown Middies 68-63 on Monday, March 8, 2010 at SUNY New Paltz in the Section IX Class AA boys' basketball championship game. 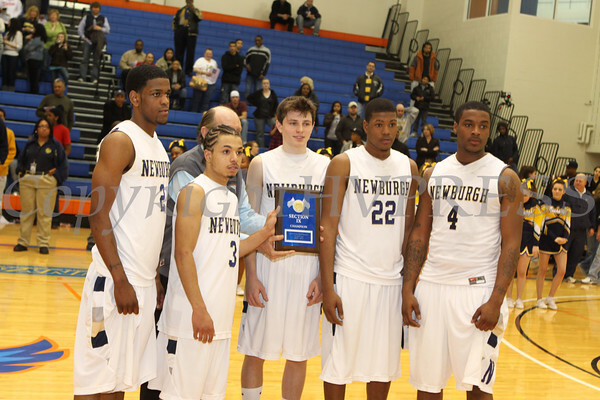 Newburgh Free Academy Goldback's Damon Cousar, Marcus Henderson, William Bouton, Patrick Johnson and Michael McLeod accept the Section 9 plaque after defeating Middletown 68-63 on Monday, March 8, 2010 at SUNY New Paltz in the Section 9 Class AA boys' basketball championship game. Hudson Valley Press/CHUCK STEWART, JR.